Even When Your Head is Deep Inside the Bowels of the Refrigerator, Rag in Hand, You can still find so many things to be grateful for. 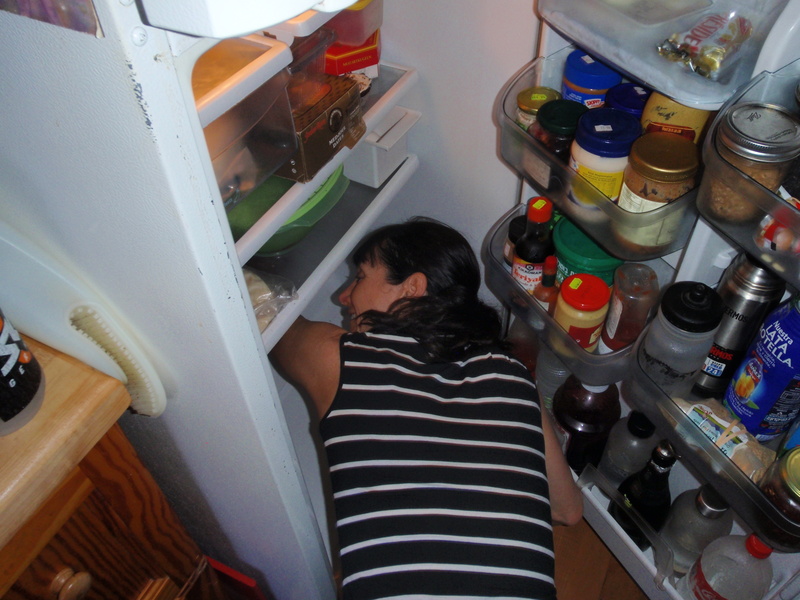 So there I was with my head in the refrigerator after spilling a bottle of homemade iced tea all over the place. I went from feeling like a happygoluckyfella to Cinderella the moment I reached for a shmateh and started cleaning. Went from feeling happy to the PLOM’s (Poor Little Old Me) faster than a Lamberghini can go from zero to 100 mph. It’s the self-pity rush, and when it starts it’s hard to stop it. So here’s what we can do. Immediately. The ABC Gratitude List. I start listing everything I have to be grateful for beginning with A and going to Z. Then I start focusing on everything that’s right in my life instead of what’s wrong. How lucky am I to have a refrigerator? That got me thinking to women around the world who have no refrigeration or water. Then I thought of the girls in Nigeria who are being held hostage by Islamic extremists. Then I thought of the girls who were raped and hung in India. Pakistan. I’d send a protest letter to someone—anyone—who’d listen. Then I thought of how to make my time spent in the refrigerator fun. I could turn it into something creative. I could laugh at myself. Thus, this blog’s message. Set the egg-timer. You can have a pity party for five minutes. Then you can take action. There is no situation that can’t be bettered. When we think, why me? Well, why not you? Finally, I look for the spiritual lesson, and I found it: humility. I thought of Pope Francis who just visited Israel. He said that “it only through humility that the church can once again become a moral beacon in global affairs.” But we each can be a beacon just by being a power of example. Not complaining, getting the job done, and accepting and celebrating the overwhelmingly wonderful ordinary parts of life. Here’s the message for Monday. Our minds can take us wherever we want to go. We can choose to sink in the darkness of self-pity or we can turn to face the sun. This entry was posted in Being a Hero In Your Life, Self-Talk, Uncategorized and tagged Helen Keller, how to laugh at yourself, humility, Pope Francis, self-pity. Bookmark the permalink. I have a gratitude list on my refrigerator. And how fitting to tell you that after reading this post! 🙂 Great message to start my week. Thank you! Hi Pam, is your gratitude list in alphabetical order? Just curious. That’s a great thing to have on your refrigerator! Thanks for your comments. Not alphabetical order but in order of importance. Family is at the top. Jeff (the hubby) had me do this a few years ago so I wouldn’t lose perspective. That’s why I love posts (and entire blogs) like yours- you remind us of what’s really important. I read all your posts and always get something from them! So thank you. Thank you, Pam. It is always good to keep gratitude in my brain because sometimes I can be like a dog and pick up a bone of resentment and start gnawing away! Interesting examples. Helen Keller should have been beatified, except I don’t think she’s Catholic, but she’s nothing short of the miraculous. I like this pope. A pope is very important to the Jewish people, almost as important as he is to Catholics. Ah, the dreaded tea spill in the fridge. I did that a few weeks ago. I don’t feel self-pity, I get mad, then I clean it up. Usually find other things to clean up while I’m doing so. You have a great attitude, Julia! Thanks. And I agree that Helen Keller was definitely a saint. Oh I hope you got the glass out of your foot, Marylin! That happened to me once, too. I always worried about Cinderella as well. It is a problem, wearing glass slippers and dancing at a ball!